"Zhao Ji" redirects here. For other uses, see Zhao Ji (disambiguation). 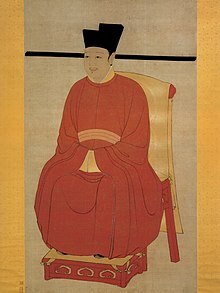 "Fine/beautiful Ancestor of the Song"
Emperor Huizong of Song (7 June 1082 – 4 June 1135), personal name Zhao Ji, was the eighth emperor of the Song dynasty in China. He was also a very well-known calligrapher. Born as the 11th son of Emperor Shenzong, he ascended the throne in 1100 upon the death of his elder brother and predecessor, Emperor Zhezong, because Emperor Zhezong's only son died prematurely. He lived in luxury, sophistication and art in the first half of his life. In 1126, when the Jurchen-led Jin dynasty invaded the Song dynasty during the Jin–Song Wars, Emperor Huizong abdicated and passed on his throne to his eldest son, Zhao Huan who assumed the title Emperor Qinzong while Huizong assumed the honorary title of Taishang Huang (or "Retired Emperor"). The following year, the Song capital, Bianjing, was conquered by Jin forces in an event historically known as the Jingkang Incident. Emperor Huizong, along with Emperor Qinzong and the rest of their family, were taken captive by the Jurchens and brought back to the Jin capital, Huining Prefecture in 1128. The Jurchen ruler, Emperor Taizong of Jin, gave the former Emperor Huizong a title, Duke Hunde (literally "Besotted Duke"), to humiliate him. After his surviving son, Zhao Gou, declared himself as the dynasty's tenth emperor as Emperor Gaozong, the Jurchens used him, Qinzong, and other imperial family members to put pressure on Gaozong and his court to surrender. Emperor Huizong died in Wuguo after spending about nine years in captivity. Despite his incompetence in rulership, Emperor Huizong was known for his promotion of Taoism and talents in poetry, painting, calligraphy and music. He sponsored numerous artists at his imperial court, and the catalogue of his collection listed over 6,000 known paintings. Emperor Huizong, besides his partaking in state affairs that favoured the reformist party that supported Wang Anshi's New Policies, was a cultured leader who spent much of his time admiring the arts. He was a collector of paintings, calligraphy, and antiques of previous dynasties, building huge collections of each for his amusement. He wrote poems of his own, was known as an avid painter, created his own calligraphy style, had interests in architecture and garden design, and even wrote treatises on medicine and Taoism. He assembled an entourage of painters that were first pre-screened in an examination to enter as official artists of the imperial court, and made reforms to court music. Like many learned men of his age, he was quite a polymath personality, and is even considered to be one of the greatest Chinese artists of all time. However, his reign would be forever scarred by the decisions made (by counsel he received) on handling foreign policy, as the end of his reign marked a period of disaster for the Song Empire. Emperor Huizong neglected the military, and the Song dynasty became increasingly weak and at the mercy of foreign invaders, despite his recasting of the symbolic Nine Tripod Cauldrons in 1106 in an attempt to assert his authority. When the Jurchens founded the Jin Dynasty and attacked the Khitan-led Liao dynasty to the north of the Song, the Song dynasty allied with the Jin Dynasty and attacked the Liao from the south. This succeeded in destroying the Liao, a longtime enemy of the Song. A hanging painting of Emperor Huizong. However, an enemy of the even more formidable Jin dynasty was now on the northern border. Not content with the annexation of the Liao domain, and perceiving the weakness of the Song army, the Jurchens soon declared war on their former ally, and by the beginning of 1126, the troops of the Jin "Western Vice-Marshal" Wolibu crossed the Yellow River and came in sight of Bianjing, the capital of the Song Empire. Realizing his mistakes, Huizong took the blame for everything that went wrong and stricken with panic, Emperor Huizong intended to flee but was convinced by his officials to abdicate first and then flee. Huizong then feigned a stroke because Huizong in his words said that "I must use the excuse of illness. I am afraid of disorder breaking out." He then abdicated on 18 January 1126 in favour of his eldest son, Zhao Huan who is historically now known as Emperor Qinzong (欽宗). However, Qinzong sternly refused the throne, even pushing the robes off. Huizong, still feigning a stroke, wrote with his left hand "If you do not accept, you are unfilial." Qinzong said in response "If I accept, then I am unfilial." Even when Huizong summoned his empress, Qinzong still declined until Huizong ordered his eunuchs to forcibly put him on the throne. Qinzong finally gave in eventually accepting the throne. Huizong then departed the capital to flee in the countryside. Overcoming the walls of Bianjing was a difficult undertaking for the Jurchen cavalry, and this, together with fierce resistance from some Song officials who had not totally lost their nerve, as Emperor Huizong had, and Qinzong giving a town, resulted in the Jurchens lifting the siege of Bianjing and returning north. The Song Empire, however, had to sign a humiliating treaty with the Jin Empire, agreeing to pay a colossal war indemnity and to give a tribute to the Jurchens every year. From 1126 until 1138, refugees from the Song Empire migrated south towards the Yangtze River. Huizong returned from the countryside and resumed his normal activities after hearing that the siege was lifted although he was effectively under house arrest by Qinzong. But even such humiliating terms could not save the Song dynasty. 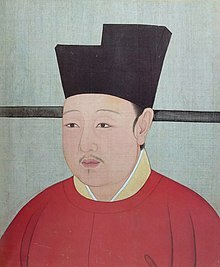 Within a matter of months, the troops of both Jurchen vice-marshals, Wolibu and Nianhan, were back south again, and this time they were determined to overcome the walls of Bianjing after Qinzong wanted to form an Anti-Jin alliance with two Liao nobles who were actually on the Jurchens side. After a bitter siege, the Jurchens eventually entered Bianjing on 9 January 1127, and many days of looting, rapes, and massacre followed. Most of the entire imperial court and harem were captured by the Jurchens in an event known historically as the Jingkang Incident, and transported north, mostly to the Jin capital of Shangjing (in present-day Harbin). After Qinzong was captured, Emperor Huizong, was persuaded to turn himself in, however, they captured Huizong. When Huizong got to see Qinzong, they cried and hugged eachother with Huizong stating "If you had listened to the old man, we would have avoided this disaster." One of the many sons of Emperor Huizong, Zhao Gou was not present in Bianjing where he went to Southern China where, after many years of struggle, he would establish the Southern Song Dynasty, of which he was the first ruler, Emperor Gaozong. Emperors Huizong and the former Emperor Qinzong were demoted to the rank of commoners by the Jurchens on 20 March 1127. Then on 10 May 1127, Emperor Huizong was deported to Heilongjiang, where he spent the last eight years of his life as a captive. In 1128, in a humiliating episode, the two former Song Emperors had to venerate the Jin ancestors at their shrine in Shangjing, wearing mourning dress. The Jurchen ruler, Emperor Taizong, granted the two former Song emperors degrading titles to humiliate them: Emperor Huizong was called "Duke Hunde" (昏德公; literally "Besotted Duke") while Emperor Qinzong was called "Marquis Chonghun" (重昏侯; literally "Doubly Besotted Marquis"). In 1137, the Jin Empire formally notified the Southern Song Empire about the death of the former Emperor Huizong. Emperor Huizong, who had lived in opulence and art for the first half of his life, died a broken man in faraway northern Heilongjiang in June 1135, at the age of 52. A few years later (1141), as the peace negotiations leading up to the Treaty of Shaoxing between the Jin and the Song empires were proceeding, the Jin Empire posthumously honored the former Emperor Huizong with the neutral-sounding title of "Prince of Tianshui Commandery" (天水郡王), after a commandery in the upper reaches of the Wei River. "Chong Ning Tongbao" in the style of Emperor Huizong's Slender Gold calligraphy. Emperor Huizong was a great painter, poet, and calligrapher. He was also a player of the guqin (as exemplified by his famous painting 聽琴圖 Listening to the Qin); he also had a Wanqin Tang (萬琴堂; "10,000 Qin Hall") in his palace. The emperor took huge efforts to search for art masters. He established the "Hanlin Huayuan" (翰林畫院; "Hanlin imperial painting house") where top painters around China shared their best works. The primary subjects of his paintings are birds and flowers. Among his works is Five-Colored Parakeet on Blossoming Apricot Tree. He also recopied Zhang Xuan's painting Court Ladies Preparing Newly Woven Silk, and Emperor Huizong's reproduction is the only copy of that painting that survives today. Emperor Huizong invented the "Slender Gold" (瘦金體) style of calligraphy. The name "Slender Gold" came from the fact that the emperor's writing resembled gold filament, twisted and turned. One of the emperor's era names, Xuanhe, is also used to describe a style of mounting paintings in scroll format. In this style, black borders are added between some of the silk planes. In 1114, following a request from the Goryeo ruler Yejong, Emperor Huizong sent to the palace in the Goryeo capital at Gaeseong a set of musical instruments to be used for royal banquet music. Two years later, in 1116, he sent another, even larger gift of musical instruments (numbering 428 in total) to the Goryeo court, this time yayue instruments, beginning that nation's tradition of aak. Emperor Huizong was also a great tea enthusiast. He wrote the Treatise on Tea, the most detailed and masterful description of the Song sophisticated style of tea ceremony. Emperor Huizong's famous descendant was Zhao Mengfu through his daughter Zhao Jinluo. Women preparing silk, a Chinese silk painting by Emperor Huizong of Song, early 12th century. Emperor Huizong of Song, Ting Qin Tu (Chinese: 聽琴圖, literally "Listening to the Qin"
^ a b Ebrey, 165. ^ Levine 2009, p. 636. ^ a b c Olson, David R.; Cole, Michael (2013-06-17). Technology, Literacy, and the Evolution of Society: Implications of the Work of Jack Goody. Psychology Press. p. 60. ISBN 9781134812981. ^ a b Ebrey, Patricia Buckley (2014-01-06). Emperor Huizong. Harvard University Press. p. 430. ISBN 9780674726420. ^ Frederick W. Mote (2003). Imperial China: 900-1800. Harvard University Press. p. 53. ISBN 978-0-674-01212-7. ^ Robert Hymes (2000). John Stewart Bowman, ed. Columbia Chronologies of Asian History and Culture. Columbia University Press. p. 33. ISBN 978-0-231-11004-4. ^ Tao (1976). Pages 20–21. ^ Ebrey, Patricia Buckley (2014-01-06). Emperor Huizong. Harvard University Press. p. 466. ISBN 9780674726420. ^ a b c Franke (1994), p. 233-234. Ebrey, Patricia Buckley. (1999). The Cambridge Illustrated History of China. Cambridge: Cambridge University Press. ISBN 0-521-66991-X (paperback). Ebrey, Walthall, and Palais (2006). East Asia: A Cultural, Social, and Political History. Boston: Houghton and Mifflin. Jing-shen Tao (1976) The Jurchen in Twelfth-Century China. University of Washington Press. ISBN 0-295-95514-7. Herbert Franke, Denis Twitchett. Alien Regimes and Border States, 907–1368 (Cambridge History of China, vol. 6). Cambridge University Press, 1994. ISBN 0-521-24331-9. Partial text on Google Books. Huiping Pang (2009), "Strange Weather: Art, Politics, and Climate Change at the Court of Northern Song Emperor Huizong," Journal of Song-Yuan Studies, Volume 39, 2009, pp. 1–41. ISSN 1059-3152. Levine, Ari Daniel (2009). "The Reigns of Hui-tsung (1100–1126) and Ch'in-tsung (1126–1127) and the Fall of the Northern Sung". In Paul Jakov Smith; Denis C. Twitchett. The Cambridge History of China: Volume 5, The Sung dynasty and Its Precursors, 907–1279. Cambridge University Press. pp. 556–643. ISBN 978-0-521-81248-1. Please see: References section in the guqin article for a full list of references used in all qin related articles. This page was last edited on 14 April 2019, at 01:28 (UTC).